The blinding sun accompanies the days, pouring the rays from a clear blue sky on the fields with yellow spikes. Vegetation, thicket of a bright green. It is the Rojava that we have discovered since crossing the Tigris, the ancient river that marks the border with Iraqi Kurdistan. The minibus departs from Kobane today. The eyes wander on a space with no obstacles, everything is clear thanks to the dry weather, in short, a chromatic drunkenness crowned by the emotion that catches you once you arrive in front of the immensity of the Euphrates. A gift from Ozlem Tanrikuli, head of the Kurdistan Information Office in Italy (Uiki), who included a visit, among the many meetings, to a stronghold, a sort of castle that dominates one of the two rivers that were the cradle of humanity. Massif, of a colour between yellow and brick red, changing with the variation of sunlight, this Roman defense construction then passed into Arab hands during the Omaiade conquest, presents ancient Koranic inscriptions but also the signs of the contemporary passage of the DAESH mercenaries who were barricaded there, fighting from the loopholes while in vain they sought the secret passage that leads from the fortress to the banks of the river. Battles ascribed to the history of the canton of Kobane, which although acting as a back front to the military clashes that are going on in other areas – as in Afrin, is engaged in a reconstruction program involving not only infrastructures and logistics but first of all the social and the human. Ozlem takes me to the Kobane civil hospital at sunset. I descend at the foot of the staircase that leads to the entrance where I am waiting for Dr. Abdullah Ahmed, health director, but I am hesitating: again I have to deal with my memories. At the end of February 2015, the hospital clinic was in a sort of garage, dirty with dust and debris, still messy and on full emergency, cut off from international aid. 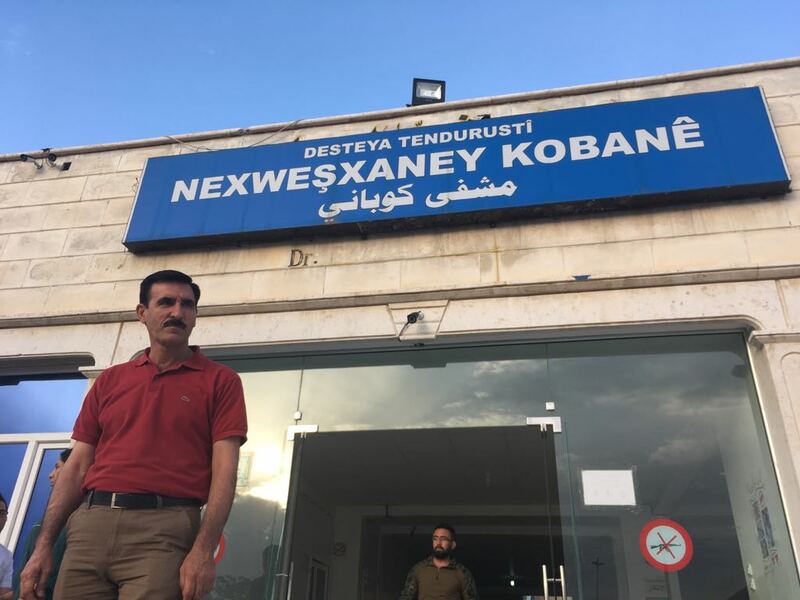 In little more than three years the health system of Kobane has risen laboriously trying to respond to the care needs of the citizens, those who returned and the new ones, the civilians who escaped from Afrin. I reach Dr. Ahmed who is wearing a red t-shirt and beige trousers and who came especially to meet me despite being on vacation. I am there to deliver a surgical kit and two aspirators purchased with funding from the “Wanda di Ferdinando” Foundation, as part of the Cooperation 4 Kobane project promoted by the Association Reciproca and the Labirinto Cooperative of Pesaro, by Coop Noncello Cooperativa Sociale from Pordenone. Uiki Onlus, and the Kobane Reconstruction Board. In his office Dr. Ahmed begs me to wait a few minutes until a woman in uniform dark green trousers and long shirt enters. “I introduce you to Dr. Merwe Mahmoud Ali, she has requested this medical supply for the paediatric ward”. We exchange a quick greeting, she has no eyes except for the heavy steel box containing the surgical instruments. Take the lid off. “We need it very much. Thank the people who did their utmost to get this help done”, she says seriously. I understand that she is of few words, she is in a hurry to get back to the ward so I assure her to report her words. I ask her if the hospital needs anything else. “An electrocardiogram device” she answers with determination. Words are superfluous, we are left with the final greeting, a warm but quick embrace, then she moves quickly to one of the wards clutching the steel box in her arms. Women in Kobane are everywhere. They are the ones who pose the concrete demands, which explain to you what has been done but above all the shortcomings to be filled. They are pragmatic in the continuous search for solutions and above all they have no time to waste. The compliments on what has been done slip on them like water. They have real needs to which we must give feasible answers. If it is not possible they move on. With different words, in all the meetings they explained how everyday life is permeated with the vital female rhythm: “Free woman means a free society” the words are from the co-mayor of Kobane Roshan Abdi, and that is why in every field of education and training the style of women was introduced, a way to stop the attack against them launched some five thousand years ago. And if the municipality sets aside 10 percent of the budget for specific projects aimed primarily at the economic emancipation of women, the education aimed at new generations is almost completely in their hands. “The Euphrates region has a total of 108 thousand students, of whom 37,000 Kurds and 71,000 Arabs”, explains Intizar Osman co-chair of the canton’s Education and Training Committee. She is accompanied by two teachers, Dozghin Ali and Amira Mehdin both members of the Kobane school board. “The number of schools is 537 in the canton of Kobane and 427 in that of Gire Spi. In the first the teachers are 2,616 and in the second 2,073. Among the Kurdish teachers there are 90% of women, a percentage that diminishes among the Arab teachers”. Going to school is compulsory up to the ninth grade. Afterwards one can choose whether to continue his/her studies or not, but one of the teachers’ tasks is to go and talk to families who are not so sure, to persuade them to change their minds. “The percentage of abandonment is 5 percent, equally divided between males and females.” The education approach is carried out in respect of the identity. “Up to the fourth grade, Kurdish children study in their mother tongue as well as Arab children” continues Intizar Osman. In Kobane the students are organized in separate classes but in the same buildings as the number of Arab children is 50. In the villages, the number is higher and the classes are in different spaces. From the fifth class, the Arabic language is inserted for Kurdish school children and Kurdish for the Arabs schoolchildren. They also begin to study the English language. The problem is the destroyed buildings but also those never built. “The Assad regime has never wanted to open high schools in the villages of Rojava, so it is up to us to build them. A bit like the university: here it did not exist and today, after the war, it sees some active departments, such as physics, mathematics, chemistry, language and art “. And the books. “Except for the mathematical and scientific texts, the others have been revised because, especially for those in history, the narrative was calibrated on the elimination of Kurdish experience. In fact, we have republished them, revisited and corrected them. There is a need to form an open and analytical mentality to build a democratic society. “Formation and knowledge remain central even in widespread cooperation projects, such as the one implemented with funds from the Autonomous Province of Trento and promoted by Professors without Borders, the Trento Historical Museum Foundation and the Association Towards Kurdistan in Alessandria. The experience is that of the residential Alan’s Rainbow educational center, in memory of the little Kurdish child whose lifeless body was found on a Turkish beach, drowned while the family was trying to cross the sea. We visit the complex with the project representatives. It hits us for its grandeur. The director of the center is Dilar, a young woman who is always smiling, a member of the Rojava Women’s Foundation, who guides us through the structure together with two girls who support her during the preparation stage and then will be part of the project’s operational staff. “The works are moving forward, we stopped because of the bad weather that until a couple of weeks ago prevented working outside” – she explains to us while we visit the ground floor of the building that will have the residential function and we move to high floors where the bedrooms are located. “The idea is to keep the doors open to the territory. That is, those who live here, whether they are children and orphans or very poor families, will be included in the public school system. We will open the nursery and creche classes to families living in the area, thus guaranteeing service to the population”. Everything is available to the community. Any project, any initiative would have no meaning if it were not aimed at inserting itself into the idea of ​​community society that permeates the reconstruction experience of Kobane and Rojava. It is a constant practice, pursued incessantly and that is reflected at the level of political representation. The role is reflected in daily practice, in the ability to solve the problems of the community, in turn a key part and protagonist: since in the end everything is reported back to the community, both the successes and the search for solutions. Part 1 of this feature can be found here.